Question and Answers, August 29th. 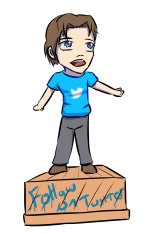 First, let me thank everyone that submitted questions. 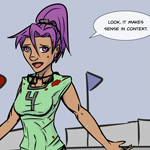 Outside-Of-Comic Questions -> Questions about stuff outside of the comic. World Questions -> Questions about the comic world. These typically have very much longer answers. The questions have frequently been abbreviated. If you feel your question has been misrepresented, feel free to contact me about it 😉 Frequently I have combined similar questions. The goal was to cover everyone’s questions, and I think I got them all. Are we going to see other magic sports? Probably. There are about five that I have a general concepts with rules and ideas, but they may or may not make into the comic. There is a lot of overhead to showing a sport since you have to introduce the rules. How many languages does Peter speak? Four. The IDS are very good at teaching language, as it essential to their job. Is Arron married/in a relationship? He was once upon a time. Will we see more of the Civil Service and Kyle? Probably. This seems like a thing that might come up. You know. In theory. I don’t get how Peter and Kally got along previously. Neither of them are likable. This appears to be a statement, not a question. What do draw with? What do you drawn on? I draw an old 12 inch Wacom Cintiq, I use Manga Studio / CSP for lines and color, and Photoshop for text, speechbubbles, borders, and some effects. Is this what you do for a living? How much money do you make from this? This is normally not a question I would have taken, but this is an amalgamation of three or four questions I got, so I figured I’d touch on this. I do not do this for a living. This is covered in the About the Author section. I’m a software engineer for a living. I make far less than minimum wage from the comic. This is okay, as I do have another job. Maybe someday I will make enough that I can spend more time on this as I get better at it. 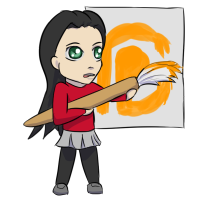 How did you promote your webcomic? Advertisement, mostly. If you flip through some of the old blog posts I write about it occasionally. Gee, I wonder what motivates this questions? 😉 Yes. English is my first language. Most of the proofreading issues come from that I change wording frequently on the pages before uploading them. Probably not helped by how I read things, which does not usually pick up missing or even entirely scrambled words. Plus, I’m a programmer by trade where typically we have IDEs that auto-correct whatever garbage we type for work. That probably doesn’t help. With the recent introduction of Reshlic language, I’ve gotten a few questions that amount to “wtf is this language why are people speaking it”. 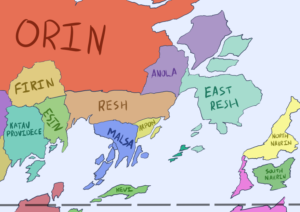 Additionally, for awhile now I’ve had a few questions about “how big is Malsa”, “Where is Orin” etc. So let’s tackle geography! 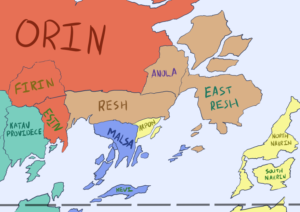 Red = Orish, Brown = Reshlic, Blue = Malsan, Yellow & Teal have not been introduced as languages. To international groups, Reshlic is far more widely spoken then Malsan, and Orish more widely then Reshlic; this is reflected by the IDS who are not regionally allocated to Malsa frequently speaking broken Reshlic and no Malsan. This tends to be averted by IDS CI and IDS CA both of who have major bases of operations in Malsa. At some point I will come out with a world map, but frankly I don’t have it yet. While the international politics and major countries are fleshed out, the actually geography is less so. Even the geography of Malsa has been changed/refined a great deal since last time I showed it on a map in comic. While my geography is pretty good, I am not exactly a geographer. Making maps is tricky. The dotted line is the northern tropic of the planet. To be frank, no, I have not named them yet 🙂 I’m sure I will at some point. Someday maybe I’ll tackle the Orin and Resh war, but lets just say they don’t like each other very much. Resh is closer in ethncity to Malsa, but they are uneasy allies due to strong cultural differences. There has not been a Resh/Malsa war in recent history though as Resh would leave the north unguarded. The specific of this question is why do we not see widespread cybernetic modification, especially autocasters being integrated directly instead of worn/held. Mechnaical/medical cybernetics are fairly established, if pretty new technology. They are easily adopted because they are low risk. Even if there are factors not yet understood, few people would decline the ability to regain an arm or leg. Things wired to your brain are technically feasible, but far less widely adopted or well understood. While they exist – we’ve seen a few people with cybernetics that tap directly into their mental faculties, it’s simply not an option/risk most people are willing to take. In regard to specifically autocasters, the advantage is not that large, since it doesn’t need to by physically wired to brain. While there are a lot of claims that if you can wire directly into your brain you can drastically improve casting time and efficiency, frankly there isn’t research data to back that up. There isn’t research data to refute it either. There simply isn’t research data. In short, cybernetic autocasters certainly exist. Mental capacity altering cybernetics definitely exist. We’ve seen a few characters that have one or the other or both. Typically speaking, however, people are distrustful of attaching things to their brain. While there is no confirmation you lose your Eidos Key when you attach cybernetics to the brain, it is certainly a popular rumor. Most people believe that at some point you would lose your Eidos Key when replacing parts of your brain, but no one really knows which piece of brain has to be removed to lose the Key, or if that’s even really a thing. Notably, it’s an area of research where there are not many test subjects volunteering. People who have lost sufficient amounts of their brain naturally to be valuable as studies have usually lost the mental capacity to use magic anyway, as it requires fairly strenuous conscious calculation as well. Cybernetics that are not integrated with the brain do not appear to have any effect on losing ones Eidos Key, and it’s widely speculated that transplanting a brain into entirely cybernetic body would retain its Eidos Key, though the technology for this is not widespread. Transplanting brains is very hard and incredibly dangerous, as well as very expensive. At the end of the day, the brain is not well understood or mapped. Altering it is generally unpredictable, and most people don’t really want to take the chance. Magic is fueled by “Mana” or “Psionic Particles”; the greater the change magic has to effect, the greater the cost. The question here regarded if a mage ‘runs out’ of mana and where mana comes from. Mages do not typically run out of mana so much as they are limited in how much they can draw or control at once. Typically the amount of mana can be determined by the density of the glowing dots around around them when they use magic, with particularly high density condensing into glowing lightning like lines. However, mages do get mentally exhausted from constant heavy calculation, just as someone may feel drained after taking an intensive calculus test. Since a lot of this calculation takes place subconsciously, this can sometimes sneak up on mage, particularly an innate. In particularly drastic cases, a mage can fall unconscious from mental exhaustion. Spells failing also tend have a very negative effect on a mage, especially if they are interfered with by an external force. What creates mana is something that may be addressed in the future, but is not an in-world understood phenomena. Very little about it is understood in world. Wait what you can comment on the front page? Ah, you’ve been tricked. These are actually comments on the blog page currently displaying on the front page. I will probably remove these (from the front page, the comments will still display on the blog posts). What I was trying to do was show the current front page comics comments without users having to click into the comic, but this is not what wordpress/comicpress decided I wanted.